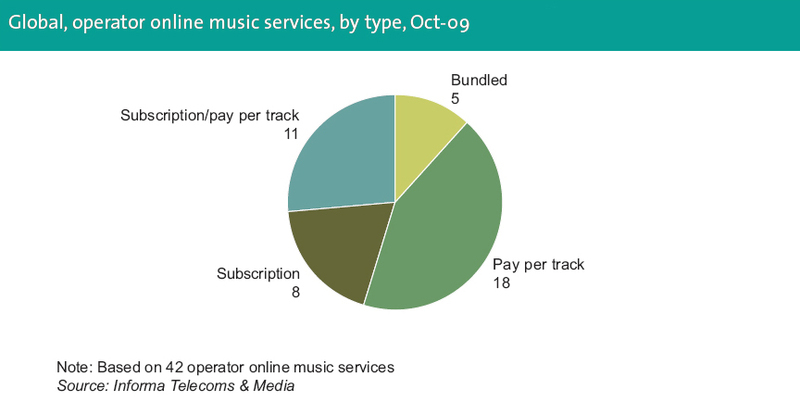 Four main types of broadband operator online music service have emerged since the first ones launched in the early part of this decade: pay-per-track, subscription-based, pay-per-track/subscription-based, and bundled. Unsurprisingly, the first services were pay-per-track, as operators attempted to ape the phenomenal success of Apple’s iTunes. But over time, many of these operators and others new to the market have embraced pay-per-track/subscription models, and a handful have launched bundled services. There are two main reasons for this shift. For one, many operators have become pessimistic about their ability to compete purely with pay-per-track services, given the spread and success of iTunes and the recent entrance of Amazon and other major retail brands into the market. Second, they find subscription models to be a better fit with the telecoms industry’s heritage, which lies largely in selling services for monthly fees. In addition, some have began to view music and other value-added services less as a source of extra revenue and more as a means to reduce churn, particularly as the online-content market becomes more competitive. By bundling their music services, they hope to at least give customers a reason to keep subscribing to their telecoms packages, even if they continue to use iTunes, Amazon or others for music as well. Despite the overall shift to subscription and bundled models, each operator is taking a slightly different approach. In some instances, operators’ choices have been influenced by the competitive conditions in their domestic telecoms and online-content markets. But in all cases, there is a strong sense that there is more experimentation is to be had – by both operators and content providers – before the right model is discovered.